It is my first time back in Sitges since my travel sabbatical. I always knew I would return here. From my first trip, I can recall watching (or rather toasting to) Spanish sunsets from a balcony with views of the beach sipping from flutes filled with Catalonian Cava. 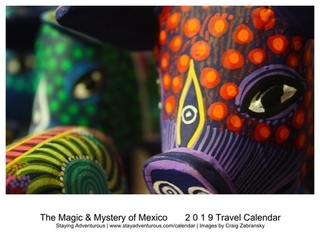 Then I was celebrating the ending of a near yearlong adventure that began in Costa Rica. This time I plan to toast to the new adventures that await me once I return back from Spain after this seventy-one day European journey. 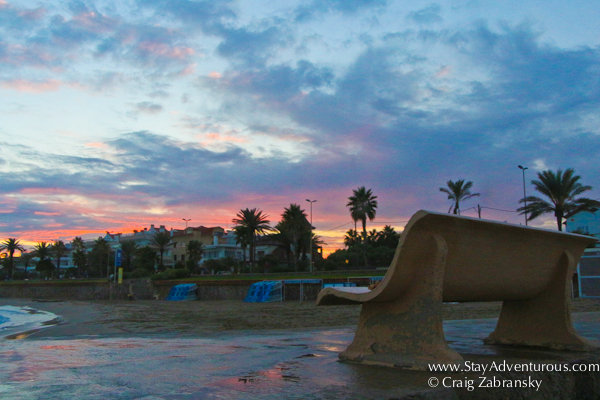 With nine days planned in the Catalonian coastal town just south of Barcelona, I still decided to head to the beach on my first evening with my camera to capture a sunset from the sands of Sitges. I was not disappointed. 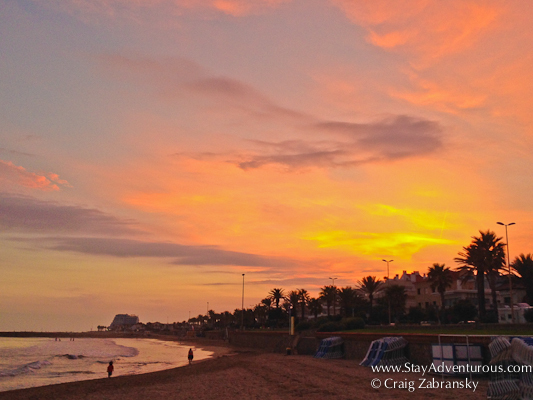 The sun doesn’t set over the Mediterranean Sea here; Sitges is on the east coast of Spain. Yet, that hardly took away from the majesty of the moment. After walking the beach, I found a lovely bench on the jetty to sit and watch the sunset’s final moments, the afterglow. I also noticed surfers riding the waves with long boards. Surf too, wow; I’m really going to enjoy Sitges again.